What is Loss of Control In-Flight (LOC-I)? What is Loss of Control In-Flight (LOC-I)? What is Loss of Control In-Flight (LOC-I)? Loss of Control In-flight (LOC-I) , over the past 50 years of statistically analyzed accident history in commercial aviation, is and has consistently been indisputably one of the leading causes of airplane crashes and crash-related fatalities worldwide. Fortunately, due to the efforts of ICAO, passionate expert industry working groups and national aviation authorities around the world, there is good news on steps being taken to comprehensively address the LOC-I threat in accordance with the Global Standard for Upset Prevention & Recovery Training (UPRT). LOC-I is generally defined as an adverse flight condition that has placed an airplane outside of the normal flight envelope with a potential inability of the pilot to control the airplane using traditional pilot skills. ICAO specifies that Loss of control In-flight (LOC-I) is an extreme manifestation of a deviation from intended flightpath. 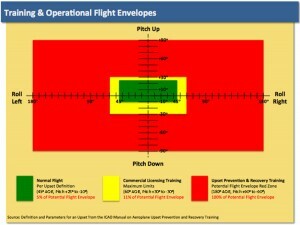 R ivaled only by Controlled Flight Into Terrain (CFIT) in magnitude and persistence, LOC-I presents a unique challenge to professional aviation as it highlights a serious deficiency in the pilot’s ability to deal with a variety of unusual flight attitudes and flight envelope excursions. Regrettably, current pilot training curricula, standards and certification requirements perpetuate this pilot-skill deficiency. 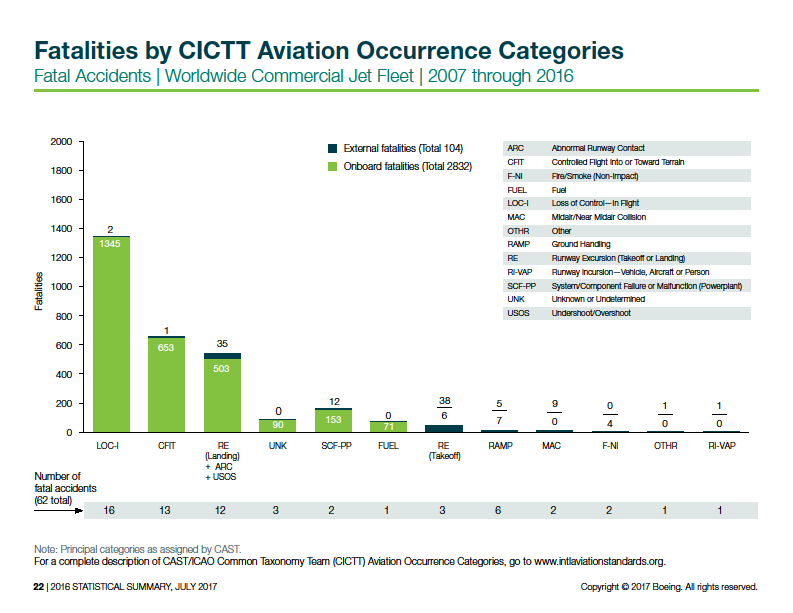 In a report issued by Boeing in August 2015, LOC-I represents the most severe cause factor in commercial aviation over the past 10 years (as indicated in the figure to the right), resulting in the most crash-related fatalities from 2007 through 2016 – even more than CFIT. In fact, in these latest statistics, LOC-I is now twice as great as the next causal factor (CFIT); or looking at it a different way, is greater than the next two factors combined (CFIT + Runway Excursions). According to the Commercial Aviation Safety Team (CAST), there has been recent aviation-industry emphasis on fatalities being a more accurate representation of the severity of an accident as opposed to hull-losses that has historically been used as an indicator of crash severity. Aviation safety organizations and legislating agencies continue to accurately identify the lethality and severity of LOC-I. According to ICAO, with loss of control in-flight (LOC-I) accidents resulting in more fatalities in scheduled commercial operations than any other category of accidents over the last ten years, reducing LOC-I is a global aviation safety priority. Why This is Such a Problem? In the figure at left, the AURTA upset pitch and bank parameters defined earlier are indicated in green. The aviation industry has historically banked on a pilot – or the aircraft’s autopilot – being able to remain within these parameters. Yet these upset boundaries represent only 5% of the complete aircraft envelope (which is indicated in red), and history – and statistics – show that aircraft repeatedly stray outside of of them. An upset, whether caused by external factors (e.g. clear air, mountain wave or wake turbulence, wind shear, etc. ), systems factors (e.g. autopilot malfunction, attitude reference error, etc.) or pilot induced factors (e.g. inattention, fatigue, disorientation, etc.) , can place an aircraft well outside of defined upset or exposed parameters very quickly – to anywhere within the pitch and bank envelope of the aircraft. Moreover, normal licensing training exposes a pilot only briefly to parameter limits in excess of industry defined upset parameters, as indicated in yellow in the above figure. Yet still, these exposed limits represents only 11% of the complete aircraft envelope. Time to react in an upset may be critical. In a study titled “Defining Commercial Transport Loss-of-Control: A Quantitative Approach,” authors James Wilborn of Boeing and John Foster of NASA determined that, in six representative LOC-I scenarios, the “Critical Window” of time beyond which a pilot would not be able to save the aircraft was anywhere from 2 to 17 seconds with an average of just under 8 seconds. Equipped with only the skills gained from normal licensing training, a pilot may be unable to cope in this environment. Delayed reaction, fear, panic, combined with an inability to correctly interpret foreign visual and other sensory cues, and a lack of the skill set required to correctly apply counter intuitive control inputs for safe recovery within this critical window, may all prevent an ill-prepared pilot from surviving an upset. Unfortunately, without any demonstrated ability to implement an effective solution commercial aviation will continue to be plagued by high rates of Loss of Control In-flight fatalities until a solution is found. Where CFIT can be economically addressed through the integration of ground proximity warning systems and synthetic vision instrumentation augmentation, technology does not currently offer a “quick fix” to LOC-I. Short of re-equipping commercial aircraft around the world with Fly-By-Wire flight control systems with all-attitude all-envelope flight control laws, an industry-wide technological solution to LOC-I is unlikely in the foreseeable future. Aviation Performance Solutions (APS) is on the leading edge of worldwide industry solutions to loss of control in-flight through industry-compliant Upset Prevention and Recovery Training (UPRT). Please take a moment to Learn More About APS and Get the Full Story on UPRT.